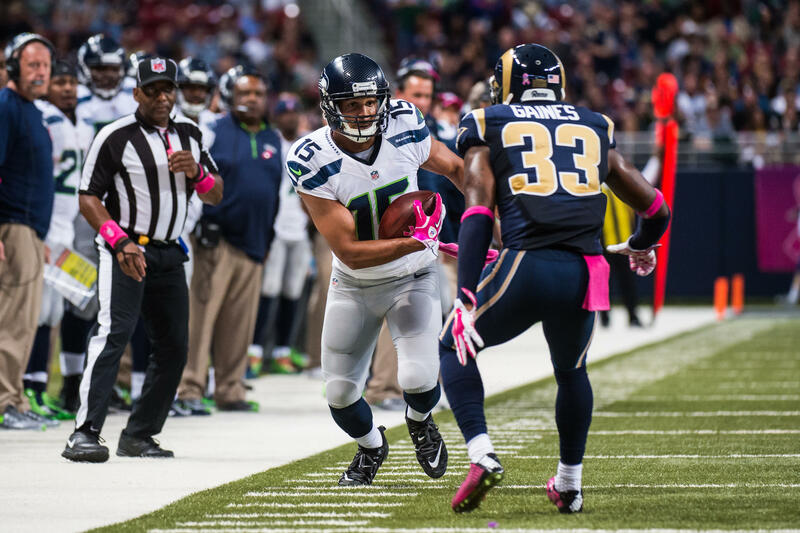 No matter how good or bad the Seattle Seahawks are, we always struggle against the St. Louis Rams in St. Louis. That is exactly what happened on Sunday. Thanks in large part to special teams, the Rams defeated the Seahawks 28-26 in a game that was frustrating to watch due to both the Seahawks play and the officials. The Seahawks fall to 3-3 on the season while the Rams improve to 2-4. Here are my thoughts on Sunday’s disappointing loss. Offense, and Getting Wilson Involved: The Seahawks offense struggled to put points on the board in the first half this week and I personally questioned the play-calling of offensive coordinator Darrell Bevell throughout the game. I was happy about the way running back Marshawn Lynch was used even though his production was not ideal, as he ran 18 times for 52 yards. What upset me were the first down pass plays and the second down run plays, which set the Seahawks up for third down and long multiple times this week. I think Bevell dropped the ball in this regard and if the Seahawks were able to stick to a running attack in the first half, the Seahawks would have come away with more than 6 points in the first 30 minutes. At halftime I called upon the Seahawks to make the necessary adjustments to get quarterback Russell Wilson more involved in the running game which is exactly what happened. In the second half Wilson ran for 82 yards and a touchdown. In addition Wilson took more shots down the field in the second half which helped the Seahawks score 20 second half points. On offense we need to avoid slow starts moving forward. If we can play a full game like how we played in the second half this week we can fix this problem and become more consistent. Defensive Struggles: The primary struggle the Seahawks are facing is putting pressure on the opposing quarterback, which in effect is allowing opposing offenses to easily convert on third down. After sacking Cowboys quarterback Tony Romo only once last week, the Seahawks struggled once again to put pressure on Rams quarterback Austin Davis. Davis was not sacked on Sunday and on third down plays the Seahawks did not send more than 4 rushers until the very end of the game. I never thought I would miss the presence of Chris Clemons so much. I am not saying Clemons alone makes the difference in last year’s defense compared to this year’s defense but on the whole the Seahawks defense has struggled mightily this season thus far. Including this loss the Seahawks have allowed 25 points in their first three road games this season. We are 1-2 in these games. Last season the Seahawks allowed an average of 20 points through their first 3 road games and went 2-1. If the Seahawks can improve the pass rush, pressure will be taken off the linebackers and the Legion of Boom and we will have a chance to be comfortably ahead in our games. Thoughts on the Rams Front Seven: Coming into this game the St. Louis Rams had only recorded one sack on the season. Today the Rams sacked Russell Wilson 3 times. I warned about the potential of the Rams defense penetrating our offensive line to get to Wilson and my fears became reality. Robert Quinn, Aaron Donald and Eugene Sims among others bullied the depleted Seahawks offensive line all day long and Russell Wilson rarely had a clean pocket to throw from. I thought that it was only a matter of time before the Rams defense had a breakthrough performance and that is exactly what happened on Sunday. This unit is one of the best in the National Football League. As a Seahawks fan I just wish we had a healthy Max Unger and a fully healthy Russell Okung. If we had our entire starting offensive line, perhaps our offense would have been more effective and we would have been able to tame the Rams defense easier. Rare Special Teams Gaffs Kill Seahawks: There were three huge special teams plays this week that cost the Seahawks points and could have cost us the game. First, Benny Cunningham of the Rams returned a first quarter kickoff 75 yards to instantly put St. Louis into Seahawks territory and into scoring range. The drive resulted in 6-yard touchdown run by running back Tre Mason. The second mistake came on a second quarter punt. 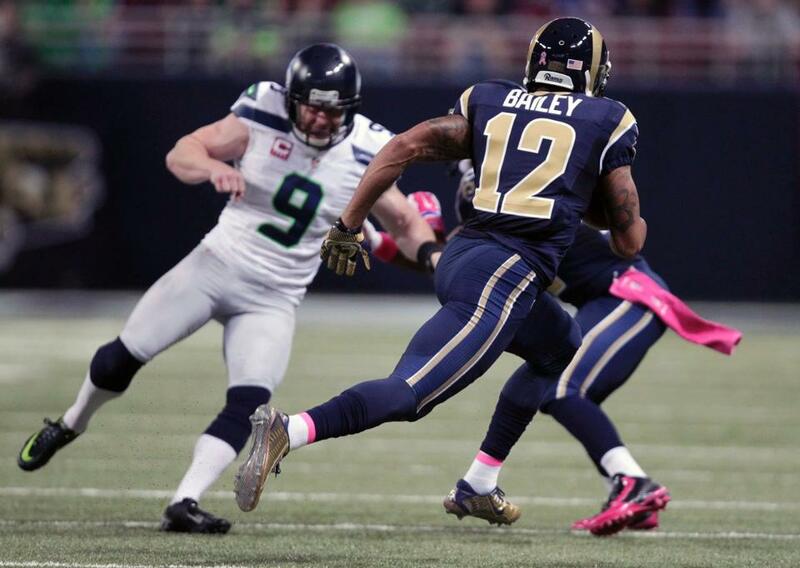 Jon Ryan punted to Rams return man Stedman Bailey who returned the punt 90 yards for a touchdown. The only problem was that the St. Louis special teams unit tricked the Seahawks special teams unit into covering decoy return man Tavon Austin. This gave Bailey a wide open field and he was easily able to return it for a touchdown. 14 points in the first half came on special teams breakdowns and in hindsight could have made the difference between the Seahawks winning and losing. The cherry on top of the cake was a fake punt pass from Rams punter Johnny Hekker to Cunningham on 4th down deep in Rams territory. The play had to be executed perfectly, as a screw up would have resulted in a turnover, Seahawks ball deep in St. Louis territory down by 2 points, and an easy opportunity for Seattle to re-take the lead. Instead the Rams executed the fake punt flawlessly and the Rams were able to run out the clock to preserve the victory. Of all these mistakes the fake punt irritates me the most, simply because the Rams have had recent history of fooling the Seahawks on special teams. Two years ago Rams head coach Jeff Fisher called for a fake field goal deep in Seahawks territory. Hekker found an uncovered and completely wide open Danny Amendola for a touchdown. It is this play that should have had Pete Carroll and special teams coordinator Brian Schneider’s attention this time around. I believe the Seahawks should have been more aware of the potential of St. Louis trickery, and the Rams caught us off guard and capitalized once again. The Fumble: Let me make this last point short and sweet. Regardless of whether or not the Seahawks recovered that fumble at the end of the game, the fact that there was no booth review to confirm who had possession of the ball infuriates me. With as close of a call that was in as close of a game that was, there should have been a booth review. I personally believe Richard Sherman fell on the fumble but there was no 100 percent conclusive evidence to overturn the call on the field. After a full game of questionable officiating this play put it over the top. I am not blaming the referees by any means necessary; the Seahawks put themselves in this position and lost the game. However the fact that no booth review was called on this crucial play is enough to make every Seahawks fan mad. 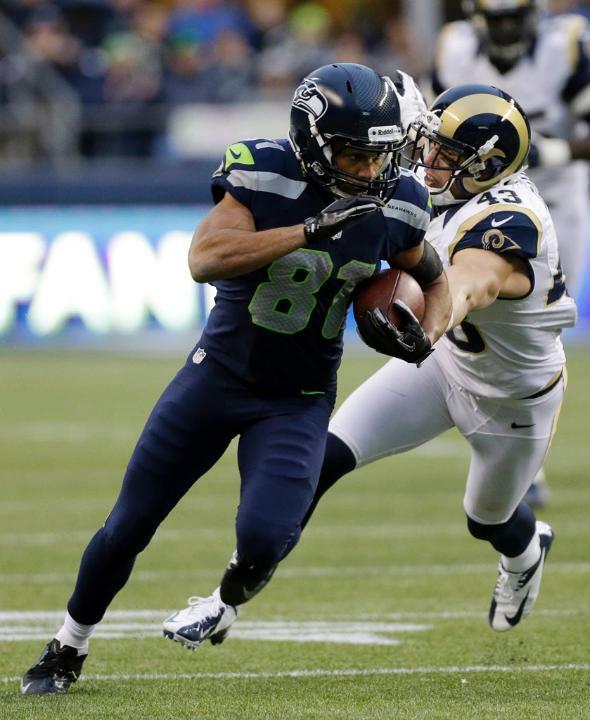 Random Thoughts: The Seahawks need to retire the white jersey/wolf grey pant combination. Since the Seahawks updated their uniforms in 2012 the Seahawks are 0-3 in this uniform combo. I hope we do not see it on the road for the rest of the season and definitely not in the postseason… I liked the Rams helmet logo on the 50-yard line. It looked slick… I am not a fan of referee Brad Allen. For that being his first Seahawks game as a head referee he did not make a good impression from a Seahawks fans perspective… We always struggle in St. Louis. Period… It is hard to think of random thoughts for a 10am road game when you watch on television from home. I guess I’ll stop here. Thanks for reading everyone, even in defeat. Check back next week when I preview the Seahawks week 8 matchup with the Carolina Panthers. Go Hawks!